Other Products: Distress inks, Stormy Sky and Pumice Stone, Smooth white cardstock, Die-cutting Machine, Score Board, Distress Oxide Rusty Hinge, Hot Glue Staedtler Pencils. Instructions: To see more of this tissue box, click here. Using Album Tags and Accents Die and thick back cover of the designer paper pack, cut 4 pieces of tags and glue them together to create 2 sets of thick tags. Choose the paper from the designer paper collection and cover both the sides of the tags. To create a box, measuring 3" x 2 " with the height of 2 1/2", take a smooth kraft card stock measuring 6 1/2" x 8 1/2". To the longer side score at 2 1/2" first, then rotate the paper and again score at 2 1/2". You will be left with 3" in the center which will make the length of the box. On the shorter side, score at 2 1/2" first, rotate the paper and again score at 2 1/2". You are left with 1 1/2" in the center which will make the width of the box. Now on the same side score at 2" till 2 1/2" and then again score from 4" till the end. This will make the half inch hinge when folded. Repeat the process on another side. For the construction of the box, do refer to the picture shared in my post on my blog. Once the box is complete cover all the sides by pasting designer paper on all sides. Glue the box between 2 tags as shown using red tacky tape. To create vellum Tulips, stamp the multiple tulip images from Tulip Time Cling Stamp Set with Frosted white Color Box ink on Vellum sheet and sprinkle white heat embossing powder. Dust extras and heat set the images using a heat tool. Cut the images using its coordinating dies and paint them using distress oxide, Rusty Hinge. Shape the flowers on the back of a paintbrush and add rock candy stamens to the centers using hot glue. 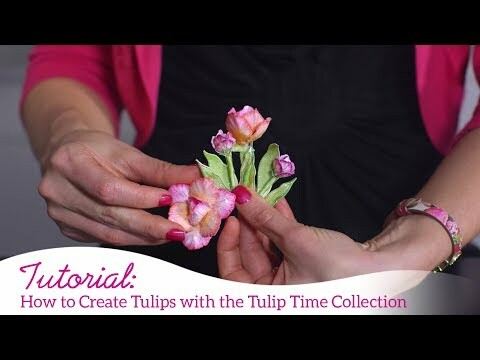 Make a small bouquet of tulips as shown in the picture. Also, white heat emboss the butterflies from Butterfly Dreams Collection the same way we did with Tulips. Color them using Distress Oxides. The fence from Tulip Cart & Fence Stamp set is stamped with black archival ink, colored using distress inks Pumice Stone and Stormy Sky and cut using its coordinating die. Extra die cuts are stacked behind the painted image to make it sturdier. Also, the filler images from Rain Boots and Blossoms Cling Stamp Set are stamped with Olive green and cut with its coordinating dies. These are then colored using Leaf Green Archival Ink and shaped using Deluxe Shaping Kit. 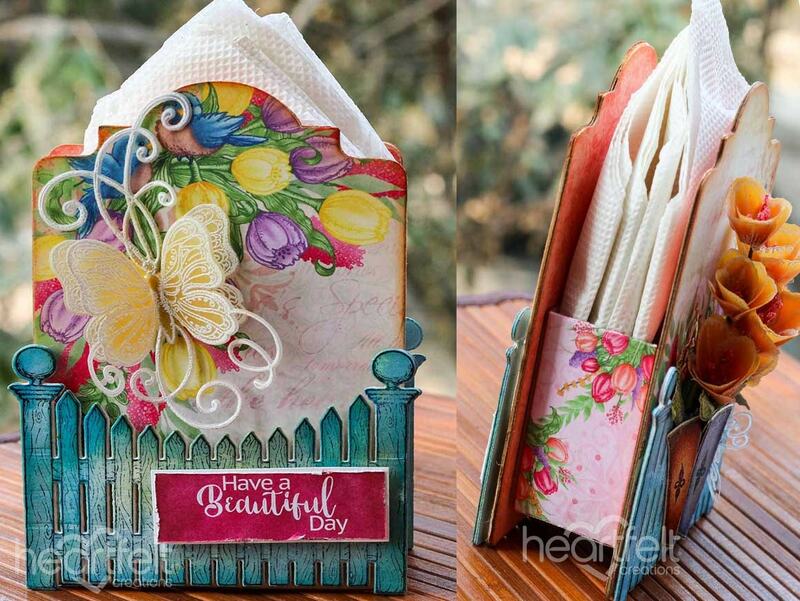 Once all the elements are ready, glue fences on both the sides and assemble a small bouquet of tulips on the fence on one side and vellum butterfly on the other side. Complete the project by adding another butterfly near the vase and add the sentiment.